The US has abandoned controversial plans to develop a nuclear "bunker-buster" warhead, a key Republican senator has said. Sen Pete Domenici said funding for the bombs - part of the Energy Department's 2006 budget - had been dropped. He said research would now focus on conventional penetrating weapons. The warhead had been the focus of intense debate in Congress, with opponents arguing against the US developing new nuclear arms. An administration official, speaking on condition on anonymity, confirmed the move to the Associated Press news agency. The Senate had approved $4m in funding for the programme, but it was subsequently blocked by the House of Representatives. Sen Domenici, chairman of the subcommittee that oversees the Department of Energy's budget, said the request for funding had been dropped at the request of the department's National Nuclear Security Administration, which oversees nuclear weapons programmes. 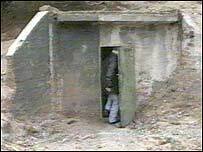 The proposed nuclear "bunker-busters" would have penetrated bunkers deep underground, including those tunnelled into solid rock. The small nuclear charge would be buried in the explosion, and the fall-out contained. However, critics doubted whether the weapon could go deep enough to contain any fall-out.